You can’t beat a fish finger sandwich! 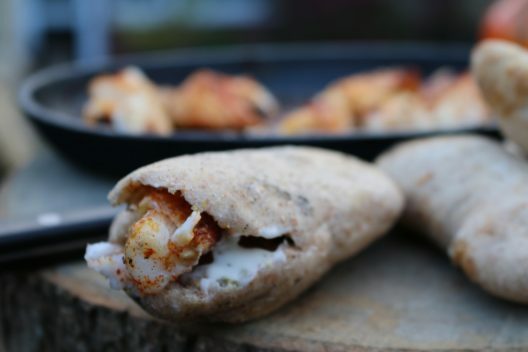 In fact back in February Birds Eye searched for the UK’s most innovative and attention-grabbing fish finger sandwich creation, I wish I had been around at the time as this recipe is a real winner! First we will make the dough for the bread and allow it to prove. Put all your dry ingredients in a bowl then add the wet ones and knead into a dough. Separate the dough into 10 to 12 small balls and leave them to prove in a warm place for at least 2 hours for best results. Next make your tartar sauce by combining all of the ingredients in a small bowl and set aside ready for later. Mix together the garam masala, paprika, mixed herbs, garlic powder, salt & pepper. This is your rub/seasoning. Cut your fish into the desired fish finger size, I think just under an inch wide is best. Squeeze the lemon juice all over the fish and then sprinkle the rub mixture over the top. Get your UUNI up to a high temperature ready to make your breads. Hand stretch you bread to be about 3 to 4 inches long and an inch and a half wide. When your UUNI is up to temperature cook you breads in batches, maybe 3 at a time turning each one after around 15 seconds. Once you have made all your breads put a cast iron sizzler pan with a small amount of oil in to heat up. Using a heat proof glove or tongs remove the cast iron pan from the UUNI and place 3 or 4 fish fingers in the pan and return to the UUNI for around 1 minute. Once your fish is cooked slice open your breads add a little tartar sauce and a fish finger.